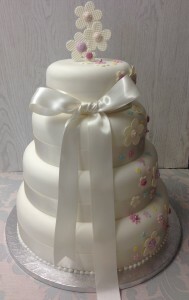 While so many Wedding Cakes today come in all different shapes and styles, we love timeless cakes that you will want to bite into even when looking at pictures of your big day years from now. Were talking cascading flowers, ruffles, lace, and more dainty details. Classic is an outstanding example of a particular style, something of lasting worth or with a timeless quality. It denotes a particular quality in art, and design.